How To Get Engagement On Social Media...Ask Questions! You are here: Home / social media / How To Get Engagement On Social Media…Ask Questions! 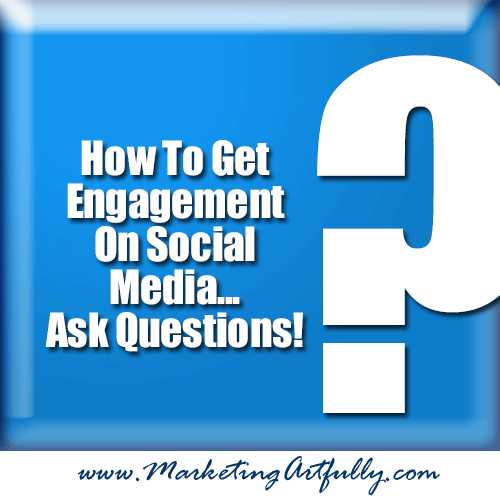 How To Get Engagement On Social Media…Ask Questions! A big topic of conversation around here is how to get engagement on social media sites like Facebook, Twitter and LinkedIn. Another big “discussion” topic is how stupid it is to foster that engagement by asking inane questions. My business partner is big on these. She is a question asking fool and I was actually skeptical that this would work. I wouldn’t answer silly questions on Facebook so why would anyone else…or so I thought! Come to find out I am compelled to answer some of these silly questions when she posts them and I KNOW that they are just to get engagement…sigh. Why do you want engagement like this? It works. Because social is about more than selling, people DO respond. They WANT to share their personal thoughts and feeling so you get engagement. Which leads us to.. It matters that people talk to you. Most of the sites use an algorithm that measures how often someone talks to you and then serves up additional “views” based on those connections. Facebook is a huge one for this. If you can get a number of people to talk to you about something non-business related, you get more opportunities to talk to them about things that truly matter. Custom messages. Last but not least in my book…they tell you things about themselves that you can use later to sell more! How cool would it be to take the answers to each of these questions and include them as tags in your database and then send customized messages based on their likes and dislikes? I haven’t done this (yet) but would love to hear if it is working for you! So what kinds of questions should you ask? Rebekah was very nonchalant about this and said, just ask them “this or that”. She can come up with millions of them off the top of her head. I on the other hand do not have this creative bone so I made her give me some examples. I will admit, once we got started it became easier and more fun to “play along”. Here are some of the best ones we came up with…feel free to use them in your social media postings AND make sure to swing back around and let me know which ones worked best!!! Winnie the Pooh or Underdog? Guns and Roses or Metallica? Alfred Hitchcock or Steven King? How bout them (insert home team)? Tootsie Rolls or M and Ms? Who has more fun? Blonds, Brunettes or Redheads? Did you come from a big city or small town? What was your all-time favorite vacation spot? What is your favorite hometown landmark? What’s your favorite thing to do in (insert town name here)? In person meetings or Skype? Who was your biggest crush? Have you ever missed an appointment? Do you mind telling people how old you are? Would you let your kids get a hampster? Do you go to the doctor when you are sick? Live up north or down south? What part of town are you from? What is your favorite rock band of all time? What is your favorite Disney Movie of all time? What is your favorite Broadway musical of all time? What is your favorite black and white movie musical of all time? Open presents on Christmas Ever or Christmas day? Does the Tooth Fairy come to your house? Do you have a favorite customer? Who was your favorite customer of all time? Well there you have it, some questions to get you started getting engagement on social media…if you have more, please leave a comment below and I will add it to the list!! !